Our Computer Aircard Just May Save Us $5,000 Providing our Mobile Internet! Yep, I've gone with a Verizon Aircard for my Internet connection. I'd planned on setting up an Internet Satellite System for a couple of years. Figured it would be required to allow me to get mobile internet with any reliability. But, as much as I thought I needed the system... that $1,700 or $5,200 for either the Tripod or Automatic satellite systems just kept getting in my way... Ouch! The bottom line was... even in Wyoming... there just weren't that many places where we just totally lost coverage... not enough to justify $5,200 anyway! In the camp we used inside Yellowstone National Park we had no cell coverage... But... maybe five miles up the road was one of the Villages.... and a solid signal. It was like that all over. So, my thinking became; even if I couldn't get online in camp, I'd be able to do my work and get it ready to upload... then, all I had to do was put the laptop in the cab when we took off on a daytrip, (which I do anyway for the use of the Navigation program) and upload my work as soon as we hit a spot with enough signal for the Aircard. Soon after that trip we made a two week swing down to Arizona for a dog agility trial. The first night out, we stopped in a Colrado State rest area just north of Trinidad. But, it wasn't really a surprise... pretty much what I was expecting... and part of the ongoing 'experiment'. The next morning, after a nice walk in the Arizona High Country, we rolled on down to Scottsdale for the trial and had a great time. 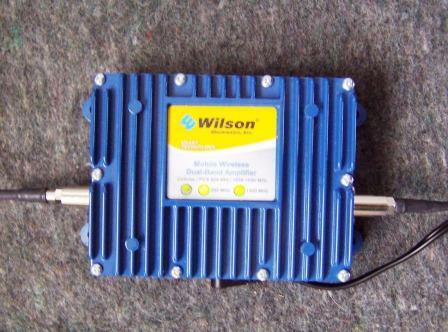 While in town, I located a dealer for Wilson Electronics and purchased an Aircard external antenna and a wireless amplifier from RF Wireless Electronics. Garrick Leach is the Sales Manager there, and gave me plenty of good counsel. He has his own website and offers some services you might be interested in as well. Works pretty neat... 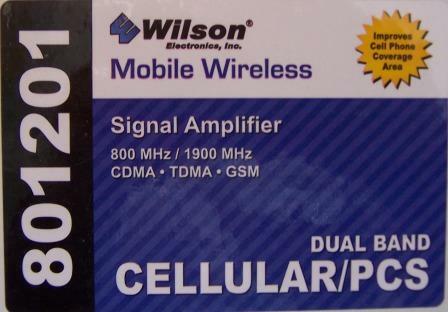 This amplifier is 'Dual Band' and being wireless, there is no direct connection to the computer or cell phones. 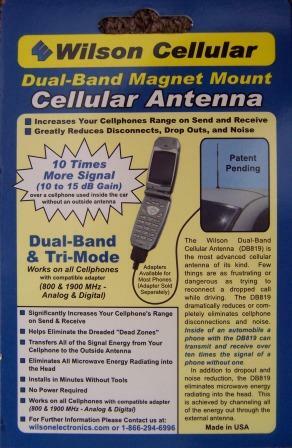 Any 'cellular' device within range of the wireless transmitters antenna will recieve an amplified signal. So 'Her' cell phone will recieve a stronger signal while I am punching away online. That 'range' is only a very few feet... pretty much the inside of the truck cab or pretty close to the 'inside' antenna inside the fiver. And it's just amplifying the cellular companies' signal... not letting someone into your computer or ISP... there isn't a security issue here. On our return trip to Colorado we once again set a camp... this time for a couple nights, in exactly the same spot we'd stayed on the way down. In fact the fiver was sitting in the same darn tracks! Once again... really poor signal... not enough for an Aircard connection.... until I set up the little antenna and plugged in the power for the amplifier. Badda Boom, Badda Bing, I was online and the phones worked. Now that was proof the Wilson Electronics Cellular / Cell phone antennas and Dual Band amplifers work! As long as there is - SOME - signal those accessory parts will amplify it to the point you can make a reliable connection. That's if there is - SOME - signal to begin with... If your Aircard is getting - NO SIGNAL - ... there ain't nothing to amplify folks! So don't blame the Aircard or the Amplifier! I spent a couple nights working and surfing.... and the whole dang Aircard System, including the after market antennae and amplifier cost me less than $400.... a lot less than the $5,000 I'd been expecting to spend on an automatic, rooftop, satellite system. As fast as they continue improving the cellular systems, I expect the Air Card service to only improve. As it is, it's working for me while allowing me to hang on to more of the precious few dollars I own! Shortly after our return from Arizona, my sickly Toshiba Laptop collapsed completely and I had to struggle though a couple weeks of turmoil getting things changed over to a new computer. One of the things I discovered was that the PMCIA card is no longer put into the computers.... they are now built with what's called a 'mini' or 'express' card... It's quite a bit smaller. There is also the option of an Aircard that uses a USB connection. When I found the change in construction I opted to get changed out to the USB720 Aircard at Verizon.... I have to say they were really good about it. I'd gone well over the '30 day test period' they advertise... but they swapped out the card, straight across for me. I thought that was pretty fair... considering the computer failure wasn't their fault and technically not their responsibility. I thought they treated me pretty fine! Another little thing with the USB720 Aircard.... it can either be plugged straight into a USB port - OR - it comes with a special cable that allows it to be plugged into TWO USB ports. That somehow gives it the availability of a little extra power for better performance... and lets you move it something like two feet away from your computer. I guess that can also sometimes improve performance.... something about possible interferrence.... more Techie stuff outside of my world. 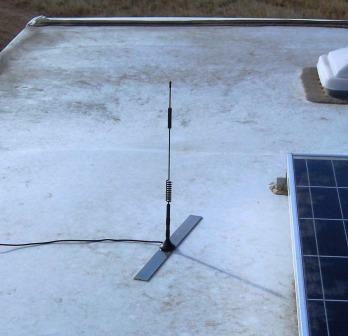 Now.... all this was done with a rinky dink little magnetic antenna.... and the truth is, it's supposed to be set on a metal vehicle roof so it has a 'ground plane'. I just stuck it temporarily to a steel ruler and set it on the rubber roof of the rig, and it still did a shining job! I've got a much bigger and better antenna on order, to permanently mount on the fiver, now that the 'test' demonstrated the system really does work well. I expect it to provide much better reception for my USB720 Verizon Aircard. The USB720 Aircard I chose has 'Dual Band' capability as well as ev-do technology... Don't ask me what all that is... suffice it to say that it works on -ALL- the available systems, new and old. If you need to do a lot of high volume work... it may be too slow for you... but for those of us that only need email, surfing and 'low volume' data transfers it's a workable system. My complete plan is to actually pick up a second amplifier to put in the cab of the truck, using the magnetic antenna I got down in Scottsdale. That worked really well in the truck on the way home. Without the Dual Band Amplifier turned on we frequently didn't have usable service... with it on, a solid connection, with that little, unobtrusive magnetic antennae!... and no mounting holes to drill in the body... another plus! Till now, I've been moving the whole outfit back and forth between the truck and the Fifth Wheel, and for me, that's a sorry pain in the part I warm chairs with! With a Dual Band amplifier in both, we'll have amplified signal in the cab on the road... as well as in the Eagle in camp.... without any of the hassles of swapping back and forth... and mobile internet.... you cannot get with satellite.... mobile internet, when you are actually Mobile on the road! Bottom line is... the coverage with a cellular based Aircard is pretty darn good, even in the west. Back east I doubt there are very many places a person will find themselves without a signal. In the west, you might have to make a short run in one direction or the other hunting signal for your Aircard... But, you can avoid that too. Just lay out a few thousand dollars for a satellite mobile internet system... and don't park under any trees! But, if you're like me... with a twisted tight budget, I'd really recommend you take a good hard look at an Aircard. I don't see any reason they aren't going to keep on improving the already good system in the future... like they have over the last few years... I expect my Aircard to just continue to work better and better... just like cell phones have.